For those of you who haven't checked it out already, head to my Youtube Channel for my full Halloween makeup tutorial for the ultimate creepy glam clown costume! As I'm sure you known, the classic horror movie IT was remade this year so scary clowns will surely be a hot costume this year. In keeping with the trend, I've opted to spend this year's spooktacular festivities as my own version of a creepy clown, faux lashes and all because you know your girl loves a lil glam! At the end of my makeup tutorial I provided a major BONUS TIP and break down all the pieces you need to complete your creepy clown costume, including the DIY clown collar and wrist ruffles I'm about to show you how to make. For the rest of my costume suggestions of things to use from home and things to purchase, watch the full tutorial here: Creep Clown Halloween Makeup Tutorial! Now let's get crafty!!! You will only need a handful of items for this DIY, all of which you can pick up from your local fabric or craft shop if you don't already have them at home! Measure the diameter of your neck and wrists. Make a note of each measurement on your phone or on a piece of paper to keep handy! 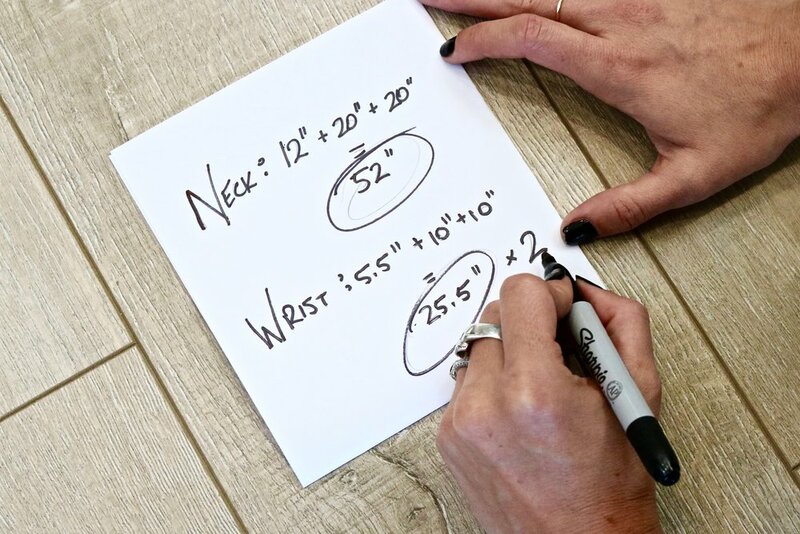 Add 40" to neck measurement for each 20" long tie of your collar. Add 20" to wrist measurements for each 10" long tie of your wrist ruffles. Cut one pieces of ribbon for the total length of your collar (including excess for ties) and cut two pieces of ribbon for total length of each wrist ruffle (including excess for ties). For example: My neck measurement is 12", so my piece of ribbon for my collar is 52". My wrist measurements are 5.5", so my two pieces of ribbon for my wrist ruffles are each 25.5". Cut out a piece of carboard as wide as you would like your collar + 1/2" for tying excess. I want mine to be quite short at 3" so I will cut a piece of cardboard that is 3.5" wide. Cut out a piece of cardboard as wide as you would like your wrist ruffles + 1/2" for tying excess. I actually want mine to be the same length as my collar so I'll just use one piece of cardboard for all three pieces. Dependent on how full you want your collar, you will need 3-5 strips of tulle per inch. I want mine very full so I will be use approximately 5 strips per inch. My neck measurement is 12", therefore I will need 60 strips of tulle in total for my collar. I am using three colors (white, black and red) so I will need 20 strips of each. If I want 20 strips of tulle, I will snugly wrap my tulle around the width of the cardboard piece I for my collar in the previous step in 20 full rotations and cut from the roll while still holding the tulle bound around the cardboard. (**You can fasten with Scotch tape if you have it handy to make this bit easier. **) I will then cut the tulle along ONLY ONE edge of the cardboard. I should now have 20 pieces that measure double the length of my preferred collar length. I will repeat this step twice using my wrist measurements. My wrist measurement is 5.5" so I will need 27.5 strips, which I will round down to 27. I have three colors of tulle so I will need 9 strips of each. To get 9 strips of tulle, I will snugly wrap my tulle around the width of the cardboard piece I for my collar in the previous step in 9 full rotations and cut at the end while still holding the tulle bound around the cardboard. (**You can fasten with Scotch tape if you have it handy to make this bit easier. **) I will then cut the tulle along ONLY ONE edge of the cardboard. I should now have 9 pieces that measure double the length of my preferred wrist ruffle length. For your neck collar, measure 20 inches from one end of your ribbon, this is where you will fasten your first strip of tulle. To fasten tulle simply fold on strip in half and place underneath your ribbon so only a 1/2" loop of tulle shows along the top of ribbon. Fold loose ends of ribbon up and over the front of your ribbon and thread through the loop. Pull tightly form a knot and move on to the next strip! You can create your own pattern, of even or random colors or you can follow my pattern of 4 white, 2 red, 4 black, 2 red and so on! This is the most time consuming part of the DIY but it's super easy and you should complete it all in about 20 minutes. Just remember to pull the knots tight and slide each piece over when you're done so you keep the strips tight, this will create the level fullness you want when you're finished! Remember to stop adding strips when you have 20" of ribbon left for your other collar tie. Repeat this step for your two wrist ruffles. Measuring 10" from one end of ribbon, fasten your first piece of tulle and carry on until you have 10" of ribbon remaining on the other end. Tie them on and head out for your Halloween festivities!! !